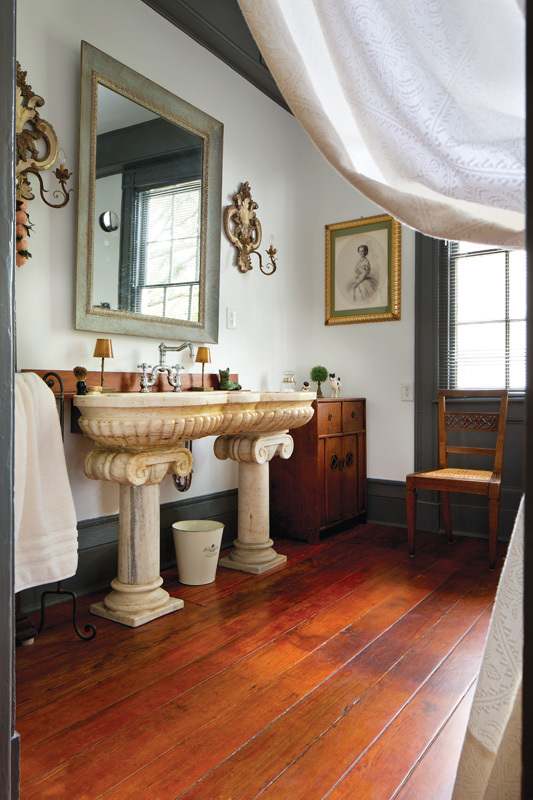 The 1836 Greek Revival house, built by a member of the prominent Taft family, remains under the diligent care of Umbrian-born preservationists with a light touch. 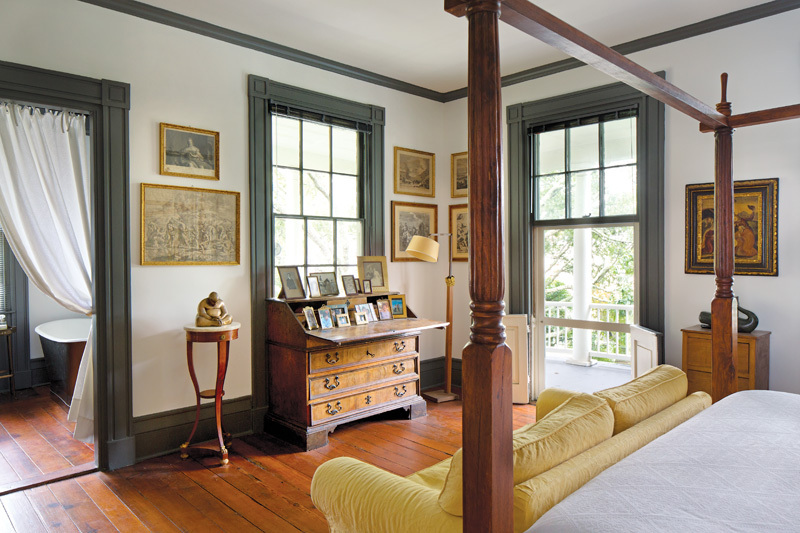 The house maintains its original floor plan, with a back parlor now furnished with leather sofas. 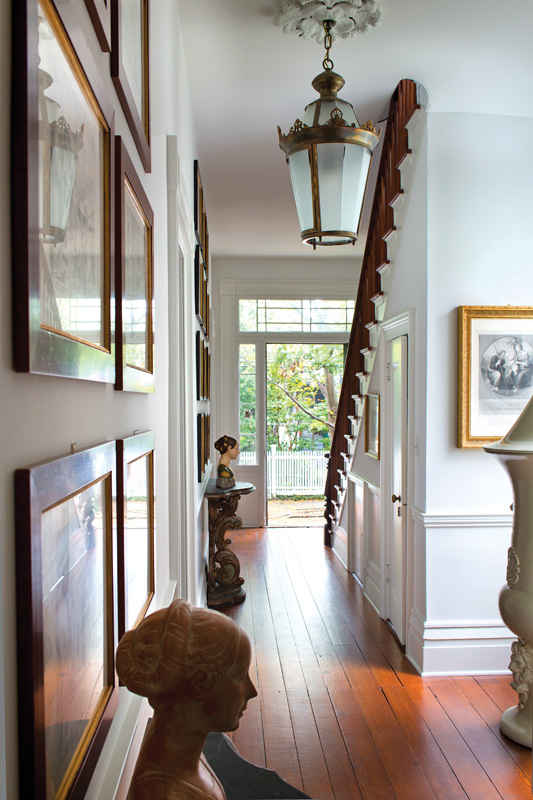 On a quiet street in the historic Ansonborough neighborhood of Charleston, South Carolina, a stately “single house” with restrained Greek Revival details survives with original elements intact. (The single house is a form almost unique to Charleston—one with its narrow side, often two or three bays wide, and its gable end facing the street and the longer side, often five bays wide, running perpendicular to the street. Thus, the piazzas open to a side garden.) Built in 1836 by Augustus R. Taft, a member of the prominent New England family that included President William Howard Taft, the house stayed in the family for more than a century. 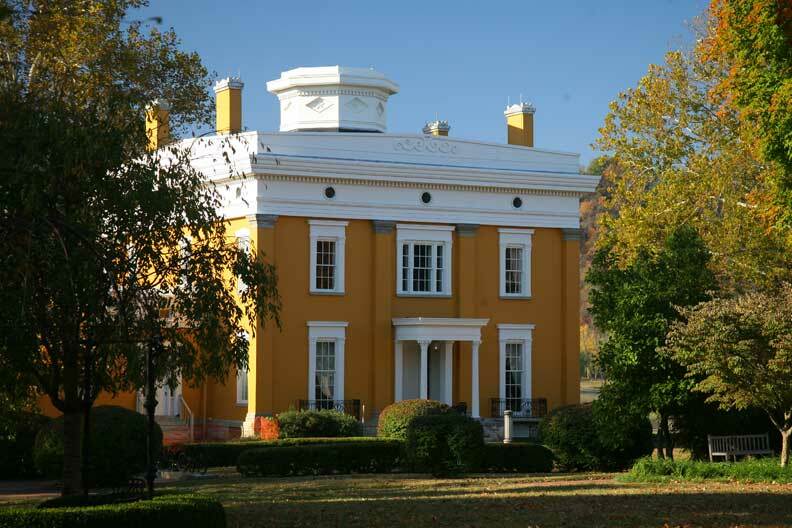 It was inherited by Augustus Taft’s daughter, who married into the old Charleston Stoney family. With the exception of six months in 1865—when the residence was confiscated by the Freedman’s Bureau to house freed slaves after the Civil War—the house had remained in the Taft family lineage. Now it’s home to Giulio and Donatella della Porta, both avid preservationists. 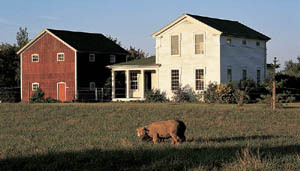 They purchased the house with strict easements already in place. In Charleston, a preservation easement is a legal agreement that protects the architectural integrity of a building. Many details of the Taft House cannot be changed or altered. Even the chandeliers that remain in the house may not be replaced, according to the easement document, which in this case runs to 30 pages. With its gleaming pine floor, the front parlor is comfortably furnished. 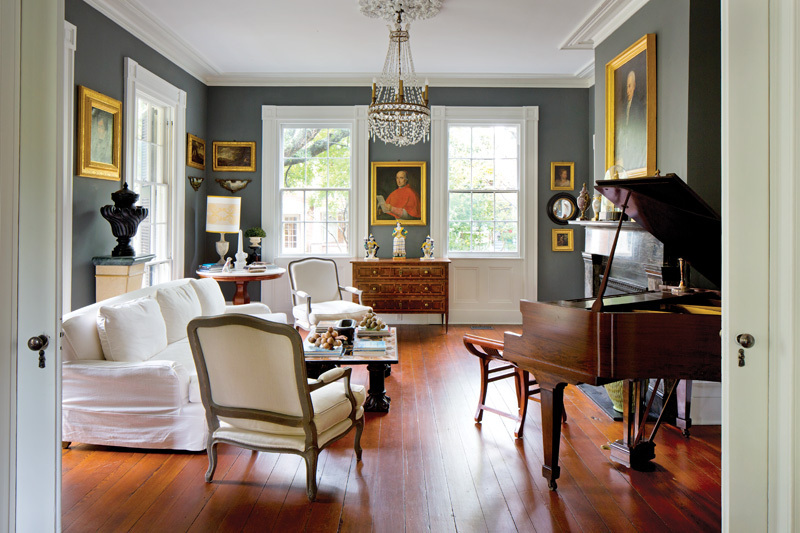 The house came down through time with its original doorknobs, black marble mantels, plaster cornices, ceiling medallions, and some lighting. Homeowners Donatella Cappelletti and Giulio della Porta met in Italy before coming to Charleston. 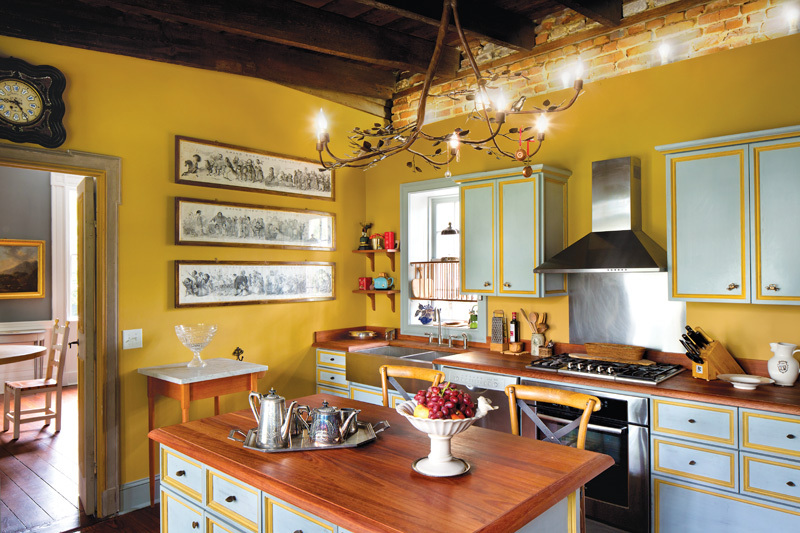 Giulio is an architect who renovated and restored many dwellings in his native Umbria, especially old stone houses dating back to the 1600s. And Donatella worked as a journalist; her father was an expert in the statuary techniques of ancient Rome. 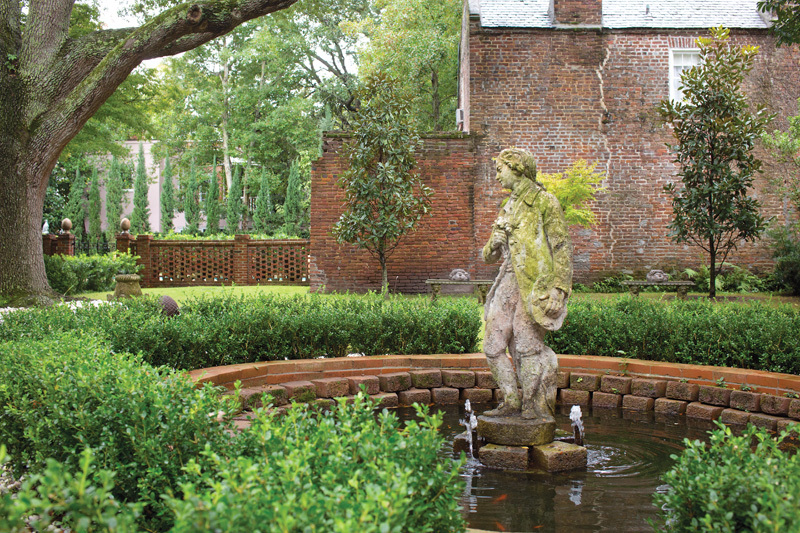 The couple discovered Charleston while on a driving tour through the southern states. After just one day walking the streets and marveling at the city’s beauty, they decided to buy a house here. 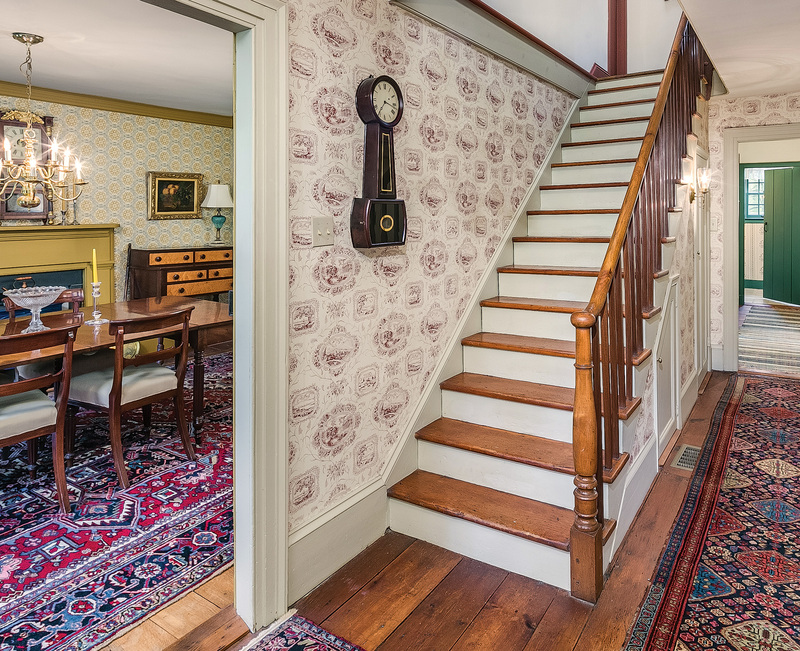 In some ways, a circle was closed when the couple bought the Taft house. Back when the house was built, it was fashionable among the sons of wealthy Charlestonians to take the Grand Tour of Europe, and Italy was the primary destination. Young people traveled to further their aesthetic education and to be schooled in the language of classical Greek and Roman art and architecture. 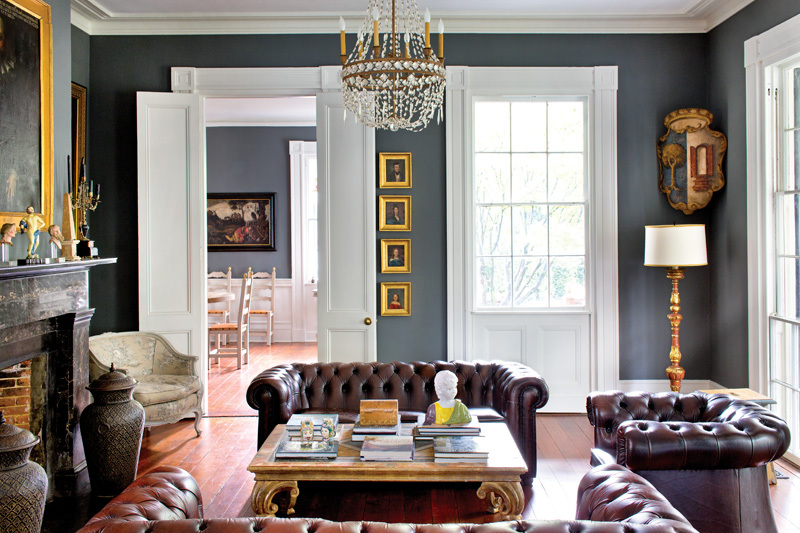 They brought back from Italy busts, Renaissance oil paintings, marble fireplaces, and portraits of themselves for their showplace townhouses in Charleston. 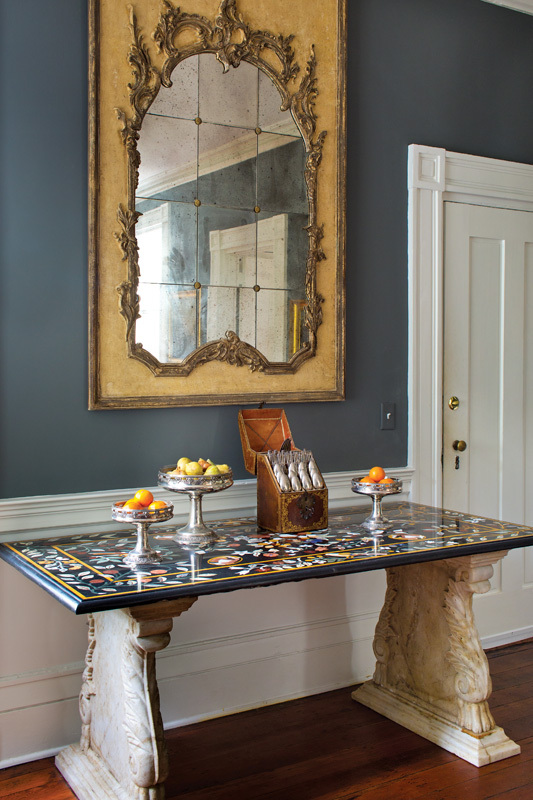 The hand-painted dining table was designed in the manner of 14th-century Tuscan furniture; doors leading to the kitchen also are hand-painted. Landscapes capture views of Rome through the eyes of 17th-century painters. Today, the della Porta home is furnished in a similar manner. Tasteful pieces brought over from Italy reflect discernment and respect for well-made artisanal products. Here reside an ancient stone bust of a Roman commander, old lanterns from Florence, landscape views of Italy done by painters in the 1600s, and a fountain statue that was once in the couple’s garden in Umbria. 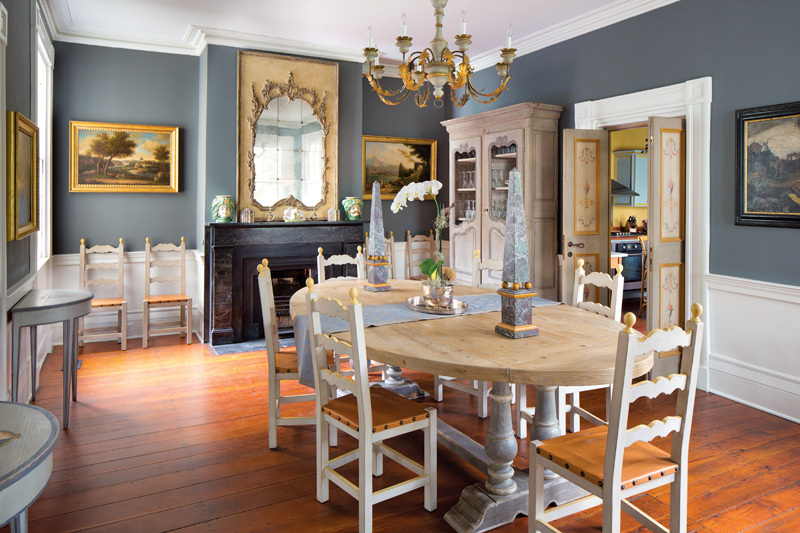 Like other old Charleston homes, this one has ancestral portraits and heirlooms, hand-painted doors, and old silver passed down through generations. By the 1730s, colonial Charleston had reached a Golden Age that lasted into the 1820s. Starting from an early deerskin trade, mercantile fortunes had been made, furthered by the successful cultivation of indigo, rice, and Sea Island cotton on plantations worked by slaves in the surrounding Lowcountry. With the profits, scores of fine townhouses in the Georgian, Adam, and Greek Revival styles were built in the city, where planters enjoyed the winter social season and escaped to town when the summer “miasma,” bringing fever and disease, was rampant in the swampy countryside. Many of these houses, with their elaborate interior architectural detailing and wide piazzas built to catch prevailing sea breezes, remain. Steve Gross & Susan Daley are photographers specializing in architecture, interiors, gardens, travel and lifestyle. They shoot assignments and produce stories for numerous magazines as well as photograph projects for architects and designers. Their books explore the rich architectural and cultural heritage of the many regions of the U.S.